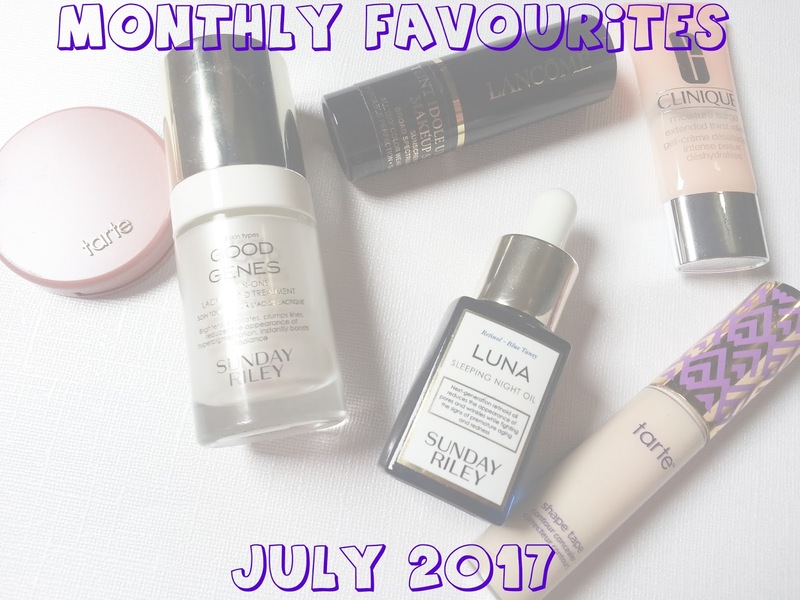 It's time for another round of Monthly Favourites! These were my favourite products for July 2017! These were the products that I reached for the most throughout the month. This refreshing, oil-free cream-gel is a "drink" for skin, continuously plumping its appearance with hydration. The luxurious, addictive texture and ultra-hydrating formula make it a frequent fliers’ favorite. It improves the appearance of fine lines, flakiness, and tightness, leaving skin looking and feeling happier and healthier—even through shifts in humidity. It immediately cools and refreshes for a soft, smooth complexion. It can be used as a five-minute moisture mask, or over makeup for a luminous glow. I've been using this gel cream strictly for under my makeup, and it works so well! I don't find it hydrating enough for night use, but during the day, it's perfect! It goes on so smooth, and soaks into the skin quickly. It doesn't pill under makeup, and its just comfortable. I'll be repurchasing a full size in the fall when Sephora has their vib sale. I've been using the Sunday Riley face products for about a month now, maybe even closer to two months, and I'm really enjoying them. My skin is less dehydrated, and I can see the fine lines on my forehead disappearing. I will wash my face, apply a toner, and then apply the Luna oil. This stuff is blue, and has a slight scent. It absorbs well into the skin, but I like to let it absorb for about half an hour, before going in with my next step, which is the Good Genes. I then let the Good Genes absorb into my skin for an hour, before going in with another serum, because I find it will easily pill if I don't give it enough time to absorb. Good Genes has a very strong scent, and it slightly stings, but it's nothing unbearable. When I ran out of the Drunk Elephant Framboos AHA, I was trying a Neostrata AHA and it actually made my skin start to peel and look/feel so dry. 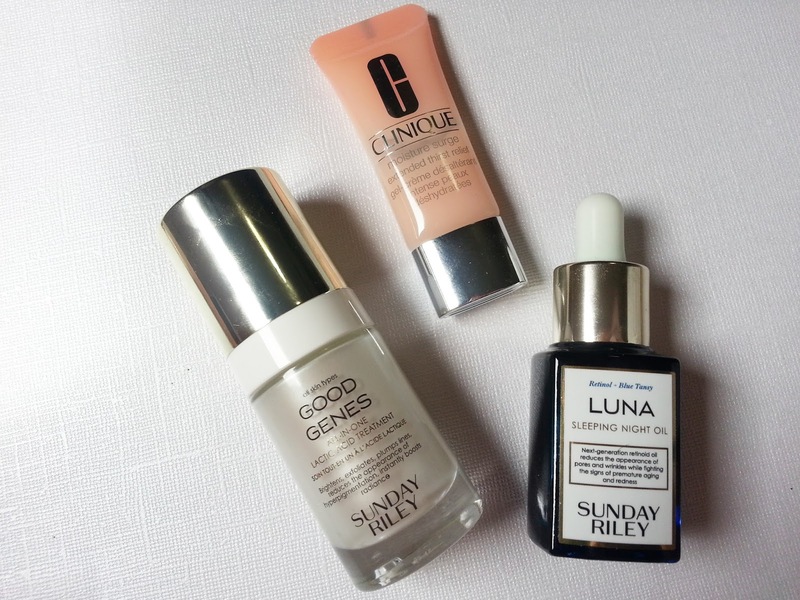 I gave that one up and started using the Sunday Riley Luna and Good Genes, and the dry skin disappeared within 3 days, and my skin began to feel great again. I'd reconsider purchasing the set again in the future. Again, during the vib sale. Hopefully it's still available then! I got this deluxe sized blush from someone in a Facebook group who was selling the blush and liquid lip from the Sephora birthday gift. This blush is a natural shade, but it's so pretty, and it really does last for the whole day! 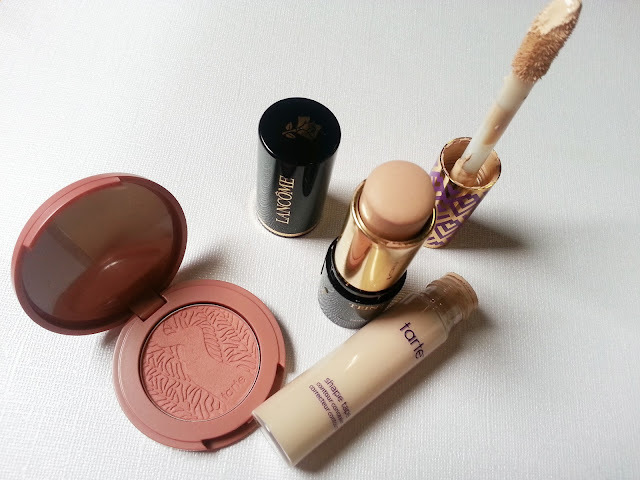 I actually receieved this stick foundation back in November 2016 as part of a ChickAdvisor campaign, and you can see my original thoughts on it here. I kind of forgot about it to be honest, and then I was going through one of my makeup aresas, and found it.. and decided to give it a go. And I fell in love with it again! It really applies beautifully, and can be used with a makeup sponge (I've been using Real Techniques Miracle Complexion Sponge) and it just looks great. As I mentioned in my past review, I do wish this was a half a shade lighter, because it is a tad too orange for me, but it goes on smooth, blends out nicely, leaves the skin looking natural, and just sits nicely on my skin when I use the Clinique Moisture Surge gel cream. I'm glad I've rediscovered it, because it's all I've been reaching for throughout July! I did an initial review on the shape tape here. Hearing other reviews, I was afraid that it might cling to my dry patches, but I don't have that issue at all. You need a very very small amount, and the doe foot applies a lot of product, so you have to watch out when applying. But it blends out so nicely, you can use a brush, a sponge, your fingers, and there are no issues. I don't have any problems with it creasing like I do with other formulas. The one I've been using is fair (I purchased fair beige as well) and I don't feel like it matches my skin, it pulls a little more yellow, but blending it out does help. I would say it's better for your under eyes than it is to spot conceal, but it's a great concealer.